I have a very small handful of photos that were taken at night or indoors with a flash. They just don't look as good, even with a good external flash like mine. If you are indoors, pull your subject to a window and go from there. Ash turned 3 months on the 5th, but I waited until the 8th to do his pictures because I needed to do them during the day when I wasn't at work. Work, who has time for it?? Seriously! The buggy is positioned with the window light on the right, and an umbrella light on the left to avoid shadows on the other side of his face. The overall effect is not like a flash, but a well-lit room. With that said, there are plenty of photos that look awesome with shadow on one side of baby's face. 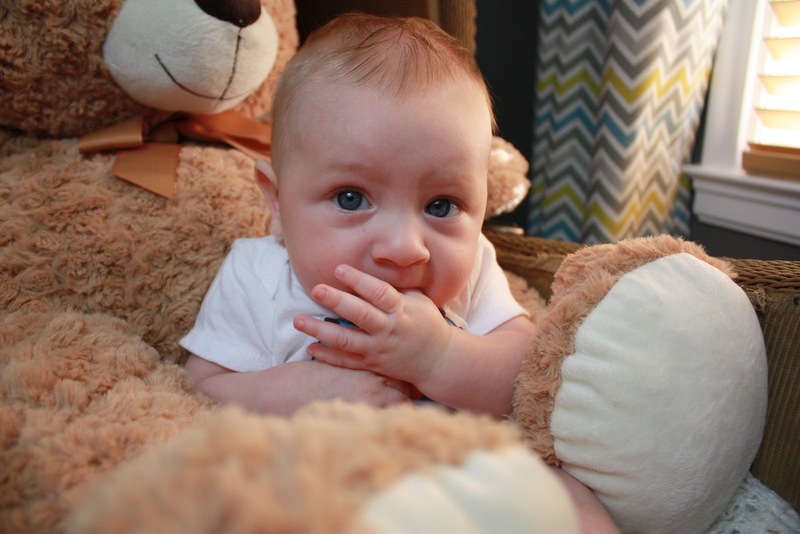 I love this contemplative pose from his 1st month shoot, without the umbrella light on the other side. or a white sheet thrown over pillows in the living room. I always make sure to select the point closest to his eyes when I set up the picture. This changes depending on whether I'm doing a tight face-only shot, or a full body one. Once you have it set, if you aren't changing positions, you can leave it the same. It makes a big difference in the clarity of your picture when the eyes are sharp. You might think auto white balance is coolio, and usually it is, but there are some times that it doesn't cut it for me. Take these two shots for example...the first one was taken using auto white balance. I thought it was looking a little too 'blue,' so I changed the white balance to 'daylight' so the camera would warm up the cool lighting. I thought the second photo looked more realistic to his skin tone. Of course, temperature can also be changed with editing later. I also find when I'm taking photos outside under a tree, the 'shade' option is a must to warm up the photo. It looks very cold and blueish without that change. It's as simple as selecting the type of lighting you are in from the easy-to-understand icons. ...but continuous shooting saved the day because he looked up a second later and the camera caught it. That function has saved me more times than I can count. Of course the downside is after a 15 minute shoot you have 150 bad blurry photos to go through and delete, but that is a price I'm willing to pay....most of the time! I have learned a lot about shutter speed and aperture since I got my camera, and I now exclusively use the 'creative' settings on my camera instead of auto. Using shutter priority and aperture priority settings allow me to get the most amount of light into my lens without sacrificing sharpness. Av (aperture priority) is my favorite for this shoot because it makes Ashford sharp, and the background fuzzy. It's worth learning about! 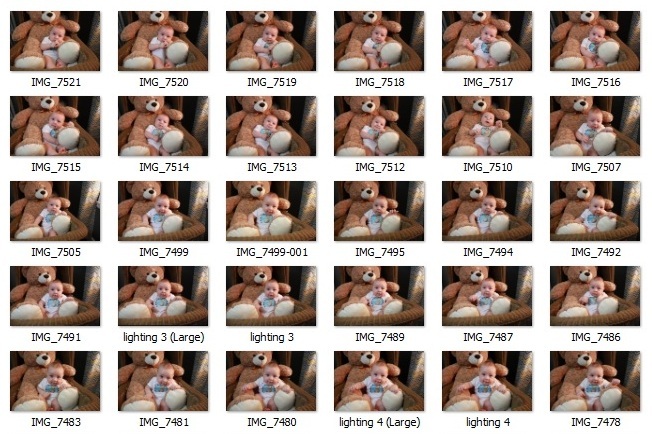 Of course all of the tips I mentioned here can be used for taking pictures of anyone, not just babies. Well, except the 'toy with flashing lights' bit, unless your family and friends are into that sort of thing. Happy shooting! Great tips, but the pics of Ash are the best part. :) He's so handsome!! Thank you for the blog and book recommendations. My husband has this fabulous camera, but rarely uses it. I really want to improve my picture quality but just the word 'aperture' scared me. ;) I'll definitely be doing some research. These are awesome tips. 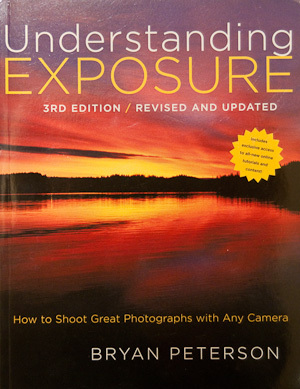 I use a few of these trickS - natural light especially. I am already dreading winter because there will be no light by the time I get home. I am totally checking out my manual focus - I didn't k ow this existed. Also, continuous shooting is suh a lifesaver. Hope all is well with you. How's back to work? Great post, Sara! After 15 months of monthly photos....I've definitely got some tricks up my sleeve. It was so much easier when she wasn't mobile....but the game totally changes after that. Whew! Great tips though....and hooray for continuous shooting :) Ash is such a handsome little man.! Thanks for the great tips and for sharing more pictures of your little guy....oh he is SO cute!!! I just want to snuggle him up. He is so handsome! And I love your suggestions. I'm on child number two and just now figuring out how to get a good shot. As for his eye color, he may end up keeping them. If both you and your husband have dominate genes (brown) then Ash may have gotten two recessive genes (blue) -- one from each of you -- that don't show up on your eyes because of the dominant brown. As a redheaded child of parents who both have dark brown hair, I should know the power of the recessive gene! Look it up ... or just enjoy those baby blues! If I could add one Id say pumping up the exposure a tiny bit can sometimes help a photo too. Not always but I tend to like a bright image.